Forever Families Through Adoption, Inc. | Forever Families Through Adoption, Inc. | How Can I Help? 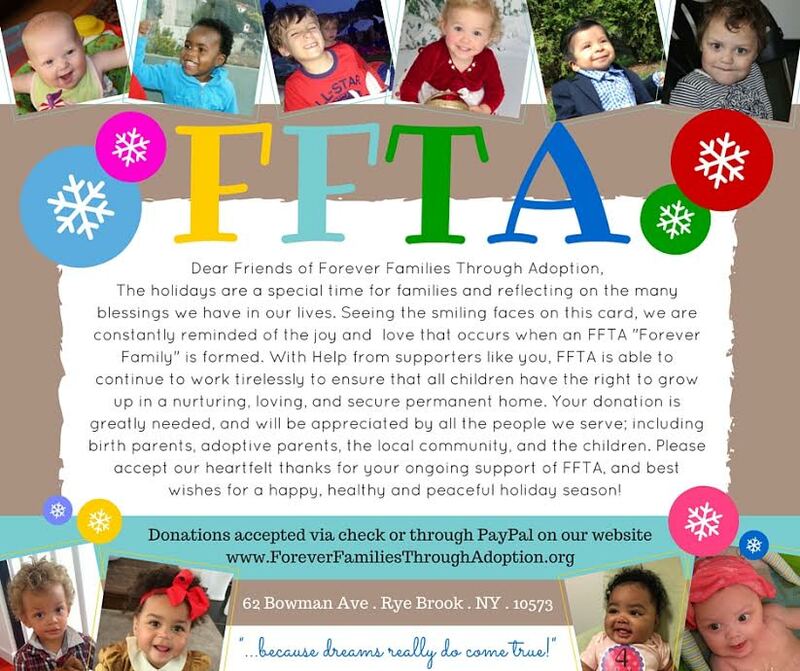 If you would like to make a donation to Forever Families Through Adoption, we currently accept donations through PayPal or you can send a check payable to FFTA at 62 Bowman Avenue, Rye Brook, NY 10573-2804. All donations are used to improve the services that we can provide to those in need unless specified. FFTA is a not-for-profit, 501(c)(3) tax exempt organization. Upon request, a copy of the latest annual report can be obtained from FFTA or from the Office of the Attorney General by writing to the Charities Bureau at 120 Broadway, New York, NY 10271 and you may also request a description of the programs and activities for which the donation has been used at FFTA. 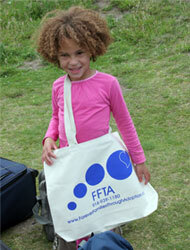 DONATE $20 or more to FFTA and receive a FREE FFTA tote bag as our thanks to you! These great bags are made from unbleached and uncolored cotton right here in the USA. Show your support wherever you go while also being environmentally friendly! Great for the grocery store, gym, baby stuff, beach, etc.! If you would like to make a donation to Forever Families Through Adoption, we currently accept donations through PayPal, or you can mail a check payable to FFTA: 62 Bowman Avenue, Rye Brook, NY 10573 and we will gladly arrange to get you your new tote bag! All donations are used towards community outreach and education. Raffle Tickets $20.00 available in advance of event or at event. A Zumbathon as you dance for the children. Join us and some of the best instructors to raise money for the cause of children's adoptions coupled with interesting exhibits and raffle prizes. Don't miss this one ! Sin importar los obstÃ¡culos que la vida le presentaba en Guayaquil, Ecuador, y mÃ¡s tarde en los Estados Unidos, ella decide seguir adelante para lograr alcanzar sus metas y objetivos que fueron bendiciÃ³n para su familia y comunidad." FFTA's Director and IronMan Sam Karliner donates to FFTA. It has been nearly 19 years since Jill and I adopted our twin sons, Elliott and Jacob and created a family. Today, our home and our lives would not be complete without them. Few people realize that nearly 60% of Americans are touched by adoption in some way. The path to adoption is not always easy. It is for this reason that I have chosen to dedicate my next race, Ironman Lake Placid on July 27, 2014 to raise awareness and funds for Forever Families Through Adoption (FFTA). FFTA is a non-profit adoption placement agency and resource center in Westchester County, which believes every child has the right to grow up in a loving, nurturing, secure, and forever home. They work with families and pregnant women to ensure a smooth and successful adoption. Adoption enabled us to create our family. But like the Ironman, the road to adoption can be a challenging one. The process stirs up a mix of emotions ranging from uncertainty and frustration to excitement and pure joy. There are times it seems like you’ll never reach your dream. Both the Ironman race and the adoption process require you to dig deep, to persevere—especially when things get tough. Most of all, both are a journey made possible by the love and support of family and friends like you. I am making a huge commitment to train for the Ironman and to raise money and awareness for a cause so close to my heart. Each stroke in the water (covering 2.4 miles), each push of the pedal (covering 112 miles), and each foot to the pavement (covering 26.2 miles) will bring me closer to my goal, but it will only happen with your love and support. I will cover the 140.6 miles, sometimes struggling, knowing that your support will be helping me reach the finish line. I ask you to please take a moment to donate by clicking here. Your donation will help other people to create their family. My promise to you is that I will bring you along on my Ironman journey. FFTA is so honored and proud that Sam has chosen us as his charity for this year's Ironman event. Please consider a donation of any size to encourage Sam to push forward with this grueling, but rewarding undertaking and to help FFTA to continue the important service we provide to the community and those in need. Purchase your tickets now for only $5 a piece. Each ticket includes a 15% off savings pass to be used all day on regular and sale priced items - including cosmetics and fragrances. In addition, each ticket includes 2 special 25% off bonus coupons for one regular or sale priced item (some restrictions may apply) FFTA receives 100% of the proceeds from ticket sales- so go ahead SHOP SMART- DO GOOD! If you plan on buying something from Amazon.com, you can help FFTA by entering Amazon.com here. Once there, save it as your Amazon favorite so you can contribute each time you shop. FFTA will receive a small percentage of what you purchase from Amazon, so long as you do not exit the Amazon website before placing your order. Remember to return to the FFTA web site after you finish shopping. There is no addition charge to you. FFTA will receive a percentage of all purchases made through iGive.com. There are hundreds of stores to choose from and you are not charged any extra. 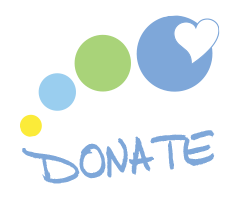 Simply go to www.iGive.com and register Forever Families Through Adoption as your favorite charity. Then, have fun shopping. In addition, FFTA will receive $5 for each new person who registers and shops within the next 45 days. There are other ways to help FFTA besides contributing money. If you have new or gently used equipment and/or supplies (maternity clothes, infant furniture or supplies, books, toys or games) and would like to donate them, we will be happy to distribute them to birth parents, adoptive parents and children in need. 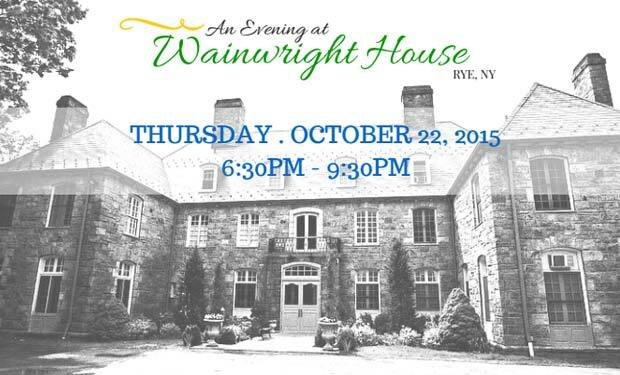 Please send or deliver any donations of this kind to our Rye Brook office at the address below. We thank you in advance. If you would like to donate your time to helping birth parents, adoptive parents or children in need, please contact us by filling out this form or calling (914) 939-1180. FFTA participates in adoption related events, exhibitions and s at which we need your help. Please refer to our calendar of events, or contact us for the most up-to-date information available. If you have questions, or would like further information on FFTA, please fill out this form and a representative will contact you as quickly as possible.